SubliJet sublimation ink systems offer the total sublimation ink delivery system. 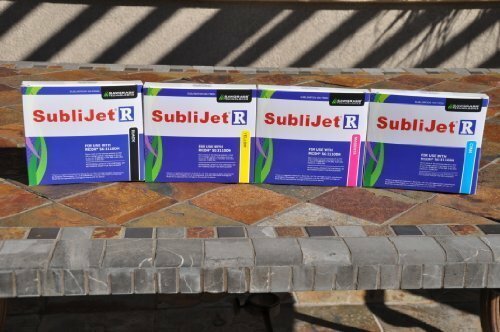 In addition to providing high-quality sublimation inks, SubliJet users enjoy PartnerPlus - a comprehensive support program, and PowerDriver - user-friendly software which makes achieving high-quality digital images a simple reality. With the wide range of substrates available for sublimation printing, the opportunity for your business to capitalize on sublimation is literally endless. From desktop systems that produce customized images on mugs, t-shirts, or plaques, to production systems capable of creating tradeshow banners and backdrops, tile murals, or sports gear, Sawgrass sublimation ink solutions will enable your business to increase your bottom line. High capacity cartridges for extended printing needs. Simple Power Driver for optimized high quality printing. Higher viscosity for peak printhead performance. Fast setup and easy color management. If you have any questions about this product by Sawgrass Technologies, contact us by completing and submitting the form below. If you are looking for a specif part number, please include it with your message.